If you’ve just started using WordPress (or even if you’ve been using it a while), you’re probably wondering what the difference between Categories & Tags is. This week one of my readers, Sharon, emailed me to ask if I would write a post to explain the differences and how best to choose them to increase website SEO. Thank you, Sharon, for the great post idea. What are Categories & Tags? Before we can really discuss the differences, we need to understand what they are and why they are used. Blogs have lots of posts and our readers want to be able to find information based on certain criteria. Categories and Tags allow us to sort our posts into groups that make it easy for readers to find what they are looking for. Imagine that you are reading a blog post about baking cookies. It’s well written, the recipe looks easy, and the photo makes your mouth water. Well, if it’s that good, I’ll bet some of the other recipes are just as wonderful. The blog itself is written by a mother of 3 who writes about her kids, managing a family budget, homeschooling, and all of the domestic chores that comes with having a house and family. She often includes recipes that her family loves and that fit within her time and budget constraints. ALL YOU ARE INTERESTED IN ARE MORE RECIPES. Depending on our blogger’s knowledge of categories and tags, this search can either easy or impossible. Categories are the broad, big picture method of sorting posts. Our blogger would have categories like: recipes, finances, homeschooling, and kids. When she writes a post, she would sort it into ONE of those categories. Granted, there might be some overlap, say finances and recipes, but in general, a post is either about a recipe or about budgeting. Tags are the more specific, more detailed method of sorting posts. Our blogger would have tags like: cookies, soups, main dishes, lesson plans, mending clothes, oatmeal, gluten free, and raisins. The cookie recipe you were drooling over would have multiple tags: cookies, oatmeal, and raisins. These are more detailed and specific to the exact topic she was covering. If you were interested in more recipes from this blogger, you would click on the category ‘recipe’ and get a list of every recipe our blogger had published. This is a way for you to find some good main dishes or soups that might work for you and your family. But, if it’s only cookies you’re interested in, you would click the tag ‘cookie’ and see all that she had written about cookies, including recipes or maybe a cookie exchange she was involved in. You could even read about gluten free recipes and foods she had written about. From a reader’s perspective, categories and tags work very much the same way: clicking on them will bring up other posts with that same category or tag. So why bother with using both categories and tags? For SEO purposes, categories are indexed while Tags usually are not. 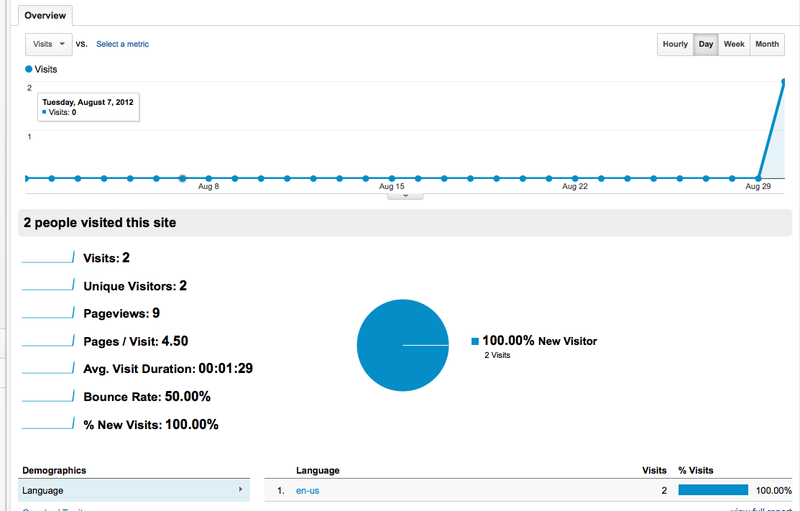 This will give the search engines an idea of what you blog about. For most of you, it will be massage and health. Google will then match the content of the post against the category to see if they match. So if our blogger writes a post about car engines and gives it the category of recipe, Google will be confused and assume that the blogger is A) a doofus or B) a scammer. You don’t want to be a doofus or a scammer, so make sure that your content matches the category. 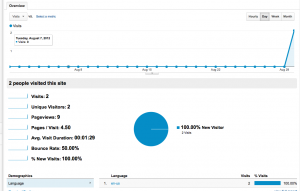 This is what I explained in the post on creating a FAQ page made of blog posts. You can’t add Tags to a menu. How many categories should you use? I have seen recommendations for keeping the number of categories at 5-7 (SEO Moz). My own category list is longer than that and needs to be pruned down to about half of what it currently is. This means that categories should be planned before you start blogging. If you haven’t done that, don’t panic. You can just start using the proper categories from now on. 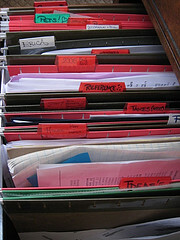 There are a ways to clean up your categories, but that’s for another time. Tags, however, are not and should not be limited to 5-7. In fact, you can have as many tags as you need. You can make up new tags specific to one post. Our blogger above could have a tag on ‘organic raisins’ for her cookie recipe. Tags, again, provide more detail. How do you use categories and tags? I like to recommend that each post have 1 category and only 1. You can add as many tags as you think apply and you can create new tags just for that post. That’s what’s fun about tags – they are flexible are infinite. What other questions do you have about categories and tags? Did you find this helpful or useful? Are you going to change how you categorize and tag your blog posts? Share your experiences in the comments below! ps – again, thanks Sharon for the great idea. Be sure to drop me a line if you want me to cover a topic or answer a question. Previously, I talked about what widgets are and how to use them. I also mentioned that I would go into depth on using the Text widget in another post. 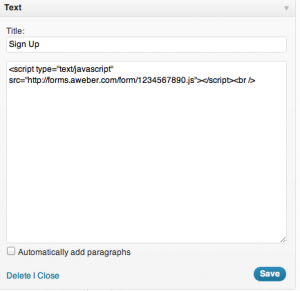 The Text widget is probably the most flexible and powerful widget that comes with WordPress. 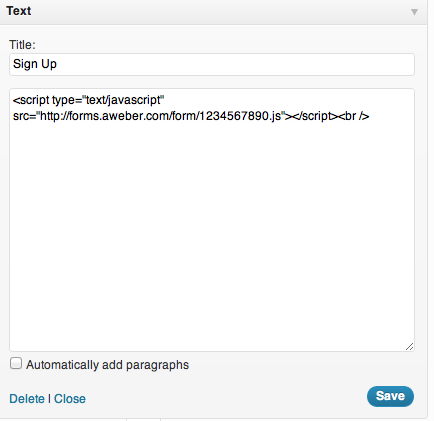 If you have a sign up box from your email autoresponder service, a ‘schedule now’ button from your online scheduling service, custom Social Media icons you want to use, or an ad banner you want to add, this is the widget you want to use. So what does all that mean? You don’t really need to know. Really. Click Save and you’re done. YOu have a fancy email signup form on your sidebar. Don’t freak out if this looks like some foreign language. Put this in your text widget and click Save. Congratulations! You’ve just learned some html. More than likely, you’ve not copied something correctly. I see this all the time. It’s easy to miss that last little > and, without that little arrow-thingy, stuff doesn’t work. So, the first thing to do is check to make sure you’ve copied EVERYTHING. Check for typos. Don’t worry about “breaking” your site – You won’t. You’ll either see all that code displayed or nothing. Double check your typing and give it another go. So go feel the power of the text widget! Play around with it. Let me know if you have questions! * If you say stuff like this, people will think you’re really cool, trust me. In business, a Widget is a fictional type of product that a company, often named Acme, manufactures or sells. In websites, a Widget is a little re-useable app that gets used in the site. In WordPress, a Widgets are “WordPress Plugins that add visitor visual and interactivity options and features, such as sidebar widgets for post categories, tag clouds, navigation, search, etc”. If you look to the right, you’ll see I have several widgets on this blog for Search, Archives and my blogroll. To use a widget, your theme must have a Widget Area. Don’t worry, you don’t have to do any fancy coding or configuration, that widget area has already been taken care of. To add a widget to your sidebar, you’ll need to go to your WordPress admin page. On the left menu, click on Appearance and then click on Widgets. 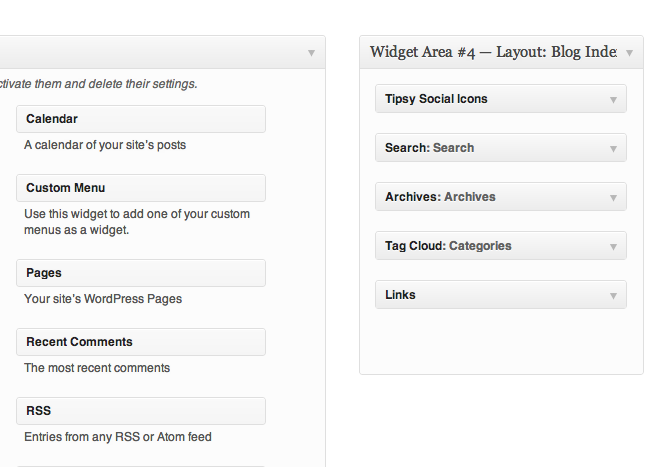 The Widgets page will show you all of your widget areas. All? Yes, some themes come with multiple widget areas. Common places to add widgets are the sidebar (the column you see on the right), the footer (the stuff at the bottom of the page, including the copyright) and sometimes you’ll see one in the header (that stuff at the top, including your logo image). Once you’ve found the widget area and a widget you want to add, simply click on the widget and drag it into the widget area. You can have more than one widget in each widget area. My page, shown here, has 4 widgets in the sidebar. If you want to change the order, just drag that widget around in the list. You might hav to configure the widget a bit. Maybe add a title or tell it how many posts to display, but there isn’t much more to do, unless you have a text widget. A text widget lets you put things like text, links, and the like. We’ll cover that in another post. 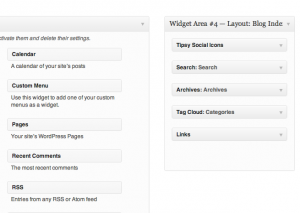 Widgets will show up on every page and post in your website without you having to add them to each page! So, you can have your phone number, address, online scheduling links and such in a widget and it will show up in every page. How many widget areas does your theme have? What kind of information would you like to have visible on every page? That’s a great way to use a widget. Let me know if you’ve successfully added a widget to your website.